Pixels are love, Pixels are life. Forgot to do the Pic of the Week last night. Sorry! There's a couple people I'd like to thank for providing free graphics. First, to SaturnYoshi, who made the background at my request. To fit in with Endless Earth's art direction a bit more I made a few edits myself. Hope you don't mind! Secondly, the tileset (which was originally a snow tileset) is thanks to Freeze. I just recolored the snow to make it look like grass. These brown tiles are merged into the same tileset as the Stone Grassland Tileset that was in the first batch of screenshots- so even though this open world will only support a a particular amount of areas, I can still provide more different looking environments to freshen things up. Its fine, your version is much better anyway. I tryed to make it look better but couldn't think of what to add, I'n glad you improved it. And you did a great job with that tileset, too! the grass could use some more shading but overall I think you did a good just converting it from snow to grass. this all the way. the grass should have more shading. but it's great otherwise. Uh, the latest pic of the week in the first post isn't the same as the one in the above post. Just a small update this week. 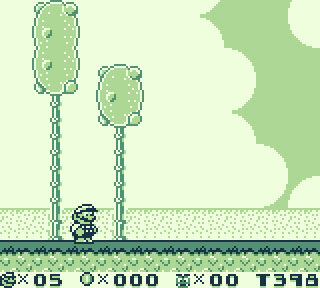 I wasn't happy with the clouds in the Grassy Plains BG, so I edited the NSMB style ones over the existing background. Looks much nicer now, if you ask me. I've still got another two Pics of the Week lined up to show in the future- but recently I've hit a mental wall with designing the desert overworld. I may have to suspend Pic of the Week after Week 7 until I can get the ball rolling again. i don't like the grassland tileset. I don't mean the snowy recolored one, I mean the one with the trees and bushes and stuff like that. it has too much less shading and the grass only uses a gradient, and that doesn't look too nice. but i like the decor. It looks better in action- my only regret about the tileset is that the tree logs are too dark. If I tried to lighten them up they would look worse. It's really difficult finding a nice wooden log texture that fits with NSMB. Well... I like that tileset, but in my opinion it's a bit too bright and the trees look errh... I don't like them. Well Spotted. That's the NSMB2 Tree platforms flipped vertically with some minor edits. That does look nicer, and I can give it a try but the tileset I'm using is cramped enough as it is. I might not be able to fit in another tile. I'll see what I can do. well, my problem is the trees. and the fact that the grass on the ground needs MUCH more shading. In fact, the ground itself needs much more shading. But I like everything else. Thierry's version is very good. Anyways, the tileset you use there clashes with the others, I mean the others are "realistic" (from NSMBWii/U etc.) But here we have a cartoon-ish tileset. Also the trees look very weird to my eyes. Just a suggestion. The Grey Pipe seen in the Underground screenshots is just a recolor of the standard pipe- replacing yellow. I don't like playing Russian Roulette with jyotyu editing so I tend to be very careful with it. As i remember the pipe textures don't have a connection with jyotyu. Pipes are not a part of jyotyu directly, but if I recall correctly they share the same palette file. I've changed the pipe textures without messing with jyotyu before. I'd make a backup though, just in case.